ColbyRack pallet racking solutions can be tailored to your needs. We offer drive-in, push-back, satellite, double deep, mobile racking & more! Whether you want to take better advantage of your current space, or you are building a new warehouse, ColbyRACK pallet racking solutions can be tailored quickly, easily and economically to your commercial storage needs. 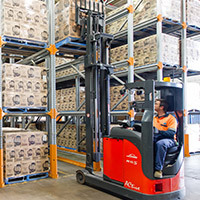 ColbyRACK is a versatile pallet racking system that can maximise your valuable warehouse space, has been designed for strength, safety, and durability, and is manufactured right here in Australia. Which pallet racking is right for my business? Unsure which type of commercial racking would be best for your business needs? Find out more about the differences between selective and non-selective systems, how storage density affects stock access, and which combination of racking systems would best solve your storage puzzles.